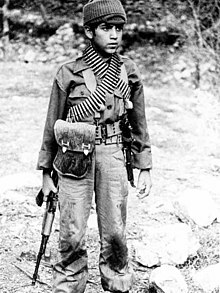 A child soldier is a child that takes part to actively fight in a war. There is no official definition. The Coalition to stop the use of Child Soldiers says that no one less than 18 years old should be recruited by regular or auxiliary troops. The age limit of 18 years is taken from the Convention on the Rights of the Child. UNICEF, terre des hommes and Amnesty International see all the combatants and their helpers that are below 18 years of age as child soldiers. There is a problem, however. If such children were classified as Combatants, this would permit to fight against children in wars. On the other hand, if such children were captured, they would then have to be treated according to the Geneva Conventions as prisoners of war. The Rome Statute of the International Criminal Court says that recruiting people below the age of 15 is a war crime, and must be prosecuted. Thomas Lubanga is currently being tried for this crime at the court in Den Haag. According to an UN source, 300.000 children were actively participating in armed conflicts, in 1996. ↑ "Impact of Armed Conflict on Children" (pdf). United Nations. 1996.